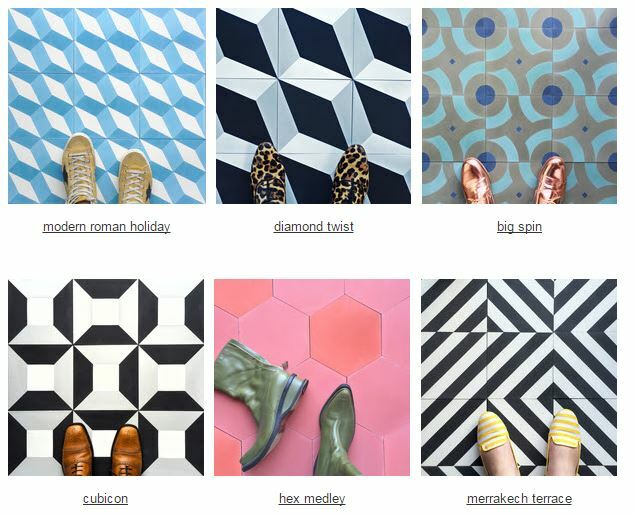 A sampling of clé’s available Cement Tile colors, patterns. clé introduces Cement tile, their modern interpretation of a century old tile legacy. Deborah Osburn, founder and creative director of clé has reimagined the hand-crafted tile with an extensive collection of over 150 new patterns and shapes, created with 50 silky matte colors. Cement tile has been used throughout the world for over 100 years, recognized for its artistic heritage, durability, and natural materials. Unlike glazed and fired ceramic, cement tile is is produced by layering concrete and cement into a steel frame. The pigmented cement is poured into brass molds, pressed and cured. Each tile is made individually, one at a time. Cement tiles at clé are available in squares, subway, hex, diamond, scallops and arabesques. There is a palette of 50 colors to choose from, producing endless options for customization. The clé Cement patterns range from Traditional and Classic to a bold Geo. New West patterns are influenced by traditional Native American designs. Shapes, colors and designs can be combined to create unlimited variegated and patchwork patterns. Cement tiles from clé arrive hand-polished and pre-sealed. Osburn has recalibrated the thickness, offering a more slender 3/8″-thick tile, which enables a cleaner edge for wall installations, allows for greater alignment with adjacent flooring surfaces, and decreases the weight of the tile. The tiles can be installed indoors and out, on floors and walls.